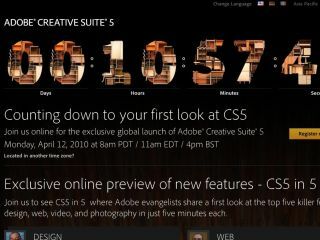 Adobe has officially announced its Creative Suite 5 software and is offering a sneak peak of the new packages online today. Our friends at Computer Arts have been testing new versions of the core applications for the past month. It will be putting these powerful new tools in the hands of creative professionals including João Oliviera, Matt Booth and Alex Donne Johnson in issue 175, on sale May 6 in the UK. You can check out Computer Arts' 40 favourite new features over at the magazine's site, but here are our favourites for each key app. 1. Fireworks CS5 enables you to constrain object proportions, edit gradients and adjust stroke alignments using the Properties panel, with a single action. 2. Flash CS5 has an iPhone Compiler: whether Apple likes it or not, it's in Flash, and it enables Flash designers to output ActionScript 3 projects to run as native applications for iPhone. 3. Create paths along 1-, 2- or 3-point perspective in Illustrator CS5, for elaborate street scenes, visualisations and so on. 4. Rather than masking objects frame-by-frame in After Effects CS5, train After Effects to do it automatically with a few strokes of the new Roto Brush, shaving hours from rotoscoping jobs. 5. Dreamweaver CS5's support for PHP-based content management systems means you can now tweak and test live sites based on Wordpress, Drupal, Joomla! or other PHP-based deployments from within Dreamweaver. 6. Photoshop CS5's Content-Aware Fill is awesome. When you cut objects out, Photoshop can automatically fill resulting space with surrounding scenery or patterns. 7. A fully functional layers panel in InDesign CS5 enables you to lock, reorder or hide text frames, images or shapes on your pages. Now find out about the other brilliant new features over at Computer Arts.